These are a few of the beauty essentials that I have been using lately. While I could go on and on about each one for hours, I am going to write a summarizing sentence about each item. Nars Blush: This blush has the perfect ratio of color to sparkle. Sephora Blush Brush: The angle of the bristles makes applying makeup surprisingly easy. Viva la Juicy Roller Ball: There is not much to say except for the fact that it smells amazing and the roller ball form is easy to transport. Sugar Rose Lip Treatment: This SPF lip treatment helps to un-chap your lips while giving you the perfect tint of rosy color. 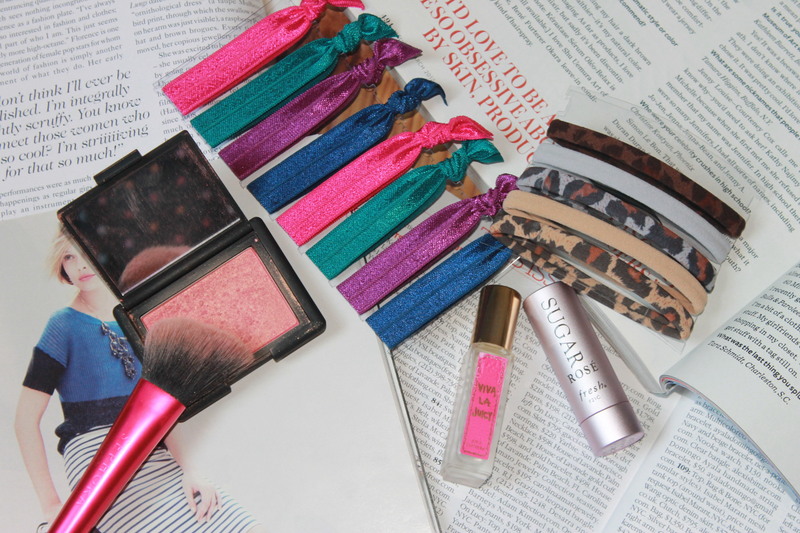 Sephora Seamless Hair Ties: These fun printed hair bands help keep your locks in a high (or low) pony while making sure not to leave a kink in your hair. Questions? Comments? Feedback? I'd love to hear from you! Drop me an email at: aroseandherclothes@hotmail.com.